A Wonderful Start to 2018: My First Shelfie! Happy New Year. Thank you for your support last year. I look forward to another year of your company on my blog. I'm starting the new year with a very short post. I've had my first shelfie! If you aren't sure what that is, it's a photo of your book on the shelf at the library or in a shop. Simple as that. It may not sound like much, but I have to tell you it is a hugely exciting moment. The Deserter's Daughter has been in stock in Conwy Libraries ever since it was published last summer, but this is the first time I have seen it on the shelf in Llyfrgell Llandudno Library. Is that because it's been out on loan all the time?! What a lovely thought. Thanks, Kirsten. Looking forward to your next monthly round-up blog on February 3rd. Thank you, Jen. I know how much you loved your own shelfies, so I knew you would be pleased about mine. What a wonderful never-to-be-forgotten moment, Susanna. Congratulations and thank you for sharing your 'shelfie' here so we can share in your excitement! How lovely of you, Kitty. More shelfies would be wonderful. Yes, it was a very special moment. What a fabulous sight! I bet it was the best feeling. I think I might have moved it on to a display table at the front though. Hehe. How wonderful!!! Such a fabulous book. It's in our local library, Susanna. It took a while for them to get it, but it's there now. I'll take a pic on Tuesday if it's not out on loan. Thanks for the congrats, Louise. That other book - it was a Lily Baxter novel, though I can't recall which one. I love her books and have read them all. 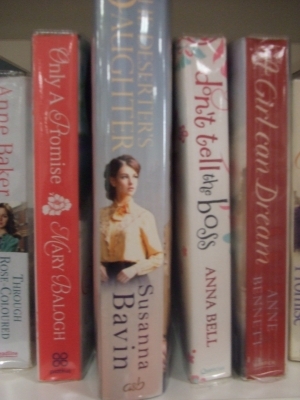 Normally I would be very happy for The Deserter's Daughter to share shelf-space with them, but not on this occasion..! Congratulations, Susanna. What a perfect moment. I have to know - what was the book that you moved out of the way? Catherine, how lovely of you. Thank you for sharing my excitement.